Hassel free, factory installed pads provide traditional protection in an easy care girdle. Machine washable and dryable - no need to remove pads for washing and drying. 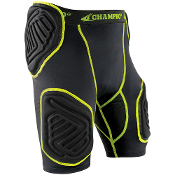 Contoured thigh pads with integrated hard plastic shock plates. Cup pocket. Elastic waistband. Nylon/Spandex fabric with DRI-GEAR and moisture management fabric. Meets NFHS standards.